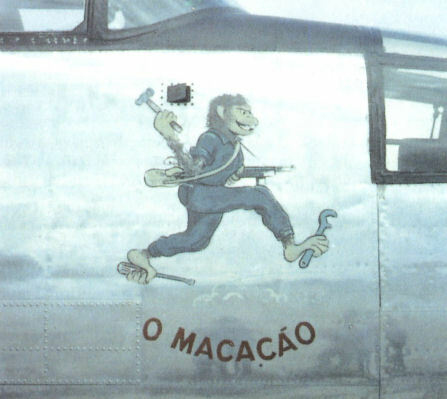 B-25Bs transferred to Brazil early in the war were flown intensively on anti-submarine and training flights '09' of the Agrupamento de Avioes de Adaptacao. 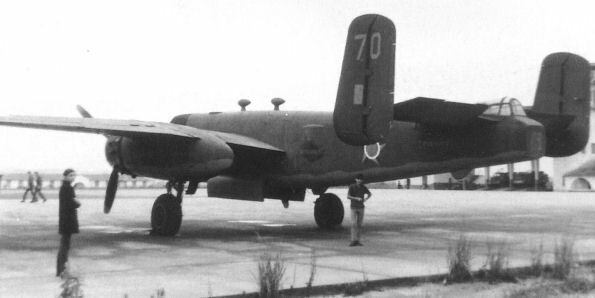 Designated on the vertical fin simply as a B-25, 5075 shown put out to pasture at Guaratintueta in the early 1960s. Although wearing markings of doubtful accuracy, B-25J 5133 is shown on open air display at the FAB facility at Pirassununga, location of the Air Force Academy. FAB 5127 in July 1970. Note the DayGlo details to wingtips and fins. One of the very few nearly 'stock' B-25Js still in existence 5127 at the Museo Aerospacial at Campa dos Afonsos near Rio de Janeiro. Close-up view of the special marking on Brazilian CB-25J 5127, 'o Macacao' (Big Ape) at it appeared in March 1970. Twin ADF 'bullets' on the upper mid fuselage, as on 5064 'O Coyote' in 1966, indicated conversion to fast transport or reconnaissance configuration by the FAB. 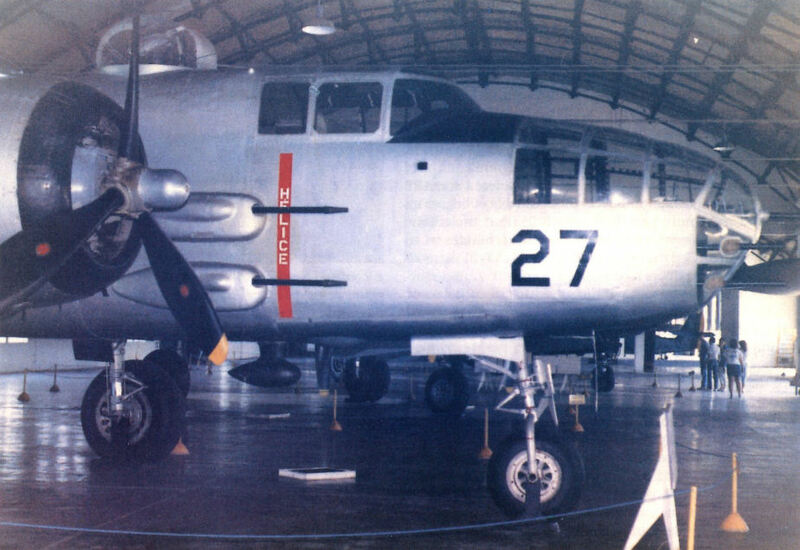 Although still officially designated as a B-25J on the fin, 5065 - as this 1960s photo shows - had all armament removed. Note that the Brazilian colours appear on both inner and outer surfaces of the rudder on an otherwise natural metal airframe. Although stripped of gun armament, 5070 was still a functioning bomber with the 1 Esquadrao/10 Grupo de Aviacao and was wearing the distinctive shade of Brazilian green on the upper surfaces and light grey undersides. FAB 5133 in service with the 1/10 GAv bearing the distinctive dark green camouflage and lower grey surfaces adopted by this unit. 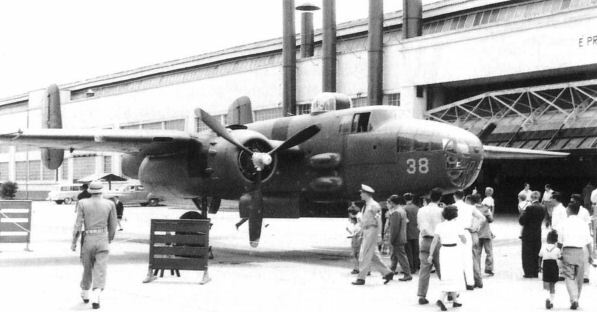 B-25J 5138 at Campo de Marte near Sao Paulo in 1950. CB-25J 5127, a dedicated VIP transports, seen in the 1960s. 5135 being contemplated by hard-pressed maintenance personnel following an apparent belly landing.